DotA Naga Siren Guide, The Naga Siren Guide, Strategy & Build. Slithice is an Agility hero which has some of her skills remade on the DotA 6.72. This post will provide you with the Naga Siren Skill Description, the Slithice Guide, the Slithice Strategy, the Slithice Item Build and the Naga Siren Skill Build. Check also the Dota 2 Naga Siren if you are playing Dota 2. Slithice was always a vagabond among the Naga, roaming beyond the boundaries of the sea in search of new things. During her adventures she met and fell in love with a young Orc raining to be a Blademaster. Though he was inexperienced he taught her many Orcish fighting tactics employed by seasoned warriors. During their courtship as she was learning how to make traps from a local raider, a swarm of Scourge came and invaded, and her love was killed before her very eyes. She used her Naga magics to put the evil to sleep and fled, and now gives her all to the Sentinel, in the name of her love. Confuses the enemy by summoning copies of Slithice, which can deal damage. Images take extra damage. Note: During the casting, Slithice is invulnerable. This can be used to avoid spell and attack damage. Upon cast most effects will be removed from Slithice. Note 2: If Slithice is targeted with an attack or skill before the attacker is in range and she uses Mirror Image the attacker will hit the real Slithice. Entraps an enemy unit in a net, rendering the unit unable to move. Note: Works on magic immune units. Interrupts channeling spells. A few spells, including Blink, will also be disabled when Ensnared. Note 2: Ensnare sets the movement speed of the affected unit to zero. Ensnare also dispels non-combat consumables. Note 3: Pugna's Decrepify will set the ensnared unit free. Calls upon the power of the seas, creating an enchanted wave that deals damage and degrades enemy unit's armor for 8 seconds. Note: Can affect units up to 1000 range away. Releases a melody around you the puts enemy units to sleep while they are in your range. Units wake up if you leave the area or the duration of the melody runs out. Slithice can choose to end the melody at any point. Note: This skill also can be able to put enemy structures to sleep. Sleeping units and structures are invulnerable until the end of the spell. Note 2: Enemy units wake up when you leave the area, or at the end of the duration. Casting the spell again will end its duration immediately. Obviously, we took Ensnare on the first level for preventing early first blood attempt. Especially when we face the dual-lane or tri-lane enemies. Rip Tide taken and maximized first, the new remade skill has the low mana and fast cooldown AOE nuke, which is good for farming and dominating the lane efficiently. Mirror Image taken on lvl 4 to be the escape mecanism as well as increases the lane control. After that maximized Ensnare to help ganking and pursuing the enemy. The Ulti taken whenever possible. Stats come last. Quelling Blade - Increases the chance of last hit which is necessary for gathering gold in early game. Power Tread - improves survivability by turning it to STR mode and of course bonus AS and MS for gaining gold efficiently and harras as well as gank the enemy. Wraith Band - Good early stats, increase survivability and damage as well. Magic Stick/ Magic Wand - is a situational item against spell spammers. Poor Man's Shield - if you have a hard time laning. Note that this item does not work with the illusions. Diffusal Blade - Purge ability which is very usefull for chasing an enemy. Also it's good to know that every hit wether from you or your images will burn the opponents mana and deal additional damage on every hit and damage type of orb is physical. And additional agility stats (Our images' damages effected by our stats not the +damage). Manta Style - Provides us with good stats (damage, movespeed, hp) and an active ability that is on a level to our Mirror Image spell, which means that we will get additional images around (total of 5 illusions). Damage maximized. Butterfly - Gives Slithice +30 agility, +30 extra damage, +30 IAS, and more 30% evasion. It's a best item for agility hero like her. Your illusions also gain some damages from the agility stats (remember that +30 extra damage and +30 IAS don't effect with your illusions). Linken Sphere - Slithice is a glassy hero which is always being targeted by deathly single spell or disable. So Linken will be a perfect item for this kind of situation. Also provide good stats for survivability. Hearth of Tarrasque - The extra strength provided will be your HP boost as well as your illusions. Also out-of-combat HP regen is what we're aiming for. Crystalys/ Buriza-do kyanon - Though you gain benefit from critical damage, your illusions do not gain +raw damage from it. But the damage from your illusion still kind of huge (about 3:2 between you and your illusion's critical damage). If you want to bring back the old Slithice which has a red number above her when whacking some guys, get this item. Battlefury - Since +damage and cleave won't work on your illusions, this item is a perfect crap. You can pick this hero if your team need carrier, gank initiator, pusher, and long-duration disabler. But don't pick this hero if enemy team has more than one AOE nuker, they will ruin your illusions. Laning with your friend (babysitter or disabler) on dual or tri lane. Choose the short-lane which your creeps are closer to the tower. It will help you farm easily while staying away from enemies. Never solo mid because you're very fragile and easy to be ganked. Especially for range heroes, they will never give you a chance to farm. The srategy is playing safe and focus on farm. Use your Rip Tide if you have a hard time to last hit every single creeps. It will assist you with enough damage and armor reduction for fast-killing creeps. Though on level 5 you can attempt to harras (or even kill) your single non-disabler hero enemy using Mirror Image-Rip Tide-Ensnare-whacks-Rip Tide combo (considering your manapool is enough to do the last Rip Tide), you'll have to be careful of being ganked, because this time your mana is not enough to do the escape procedure (ensnare or mirror image). Of course it will be more safe and efficient when your disabler teammate is around. At level 6 you are virtually invincible, thanks to your 6-secs-AOE-disable ulti. This skill is very useful when you and your team in a gank with heavy injuries. So always have your mana remaining for doing Song of the Siren in critical condition. Take a note that if you leave the area where you cast the song, the spell will disappear. When you're on Level 7 - 16. In this fase always carry TP for keeping alive while being ganked. Use a simple combo of Song of the Siren-TP to give you a 100% escape. At level 7 your Rip Tide should reach max level. The AOE -5 armor and 220 damage is no joke. It can be used for better farm, controlling lane, or easy heroes kill. The TP you already had also good for ganking the enemy. TP to other lane and intiate the gank (using Ensnare). Your team should help you with their combo to make sure the gank was success. At this point of the game we are finishing our Diffusal, which greatly increases our damage output, while purging the enemy stops them from running away (in addition to Ensnare). Remember, always have your diffusal and ensnare to the right target, for example purge Warlock's ulti to neglect it while ensnaring Rylai to stop her Freezing Field. This way you'll give benefit for your team. For the overall, your role in this fase is gank and farm, also don' forget to push the enemy tower between team clashes (your mirror images are really annoying for structures) and as always, see the minimap for saving attempt. This phase is where you are truly shine. Still, you will be no match for being ganked and combo-ed by enemy heroes. So always stay with your teammate and use your ulti depend on the situations of the team. Enemy carries is your priority, because they're so fragile for you, target them first on every team clash. Get your luxury items and always push and gank to get your hands to the Tree of Life or the Frozen Throne. 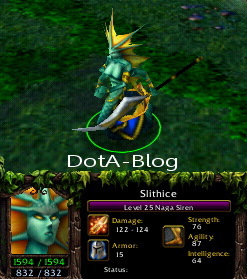 This post contain Slithice Guide & Build - the Naga Siren Strategy. If you have different build or strategy, you can give your comments or make your own guide on the Naga Siren Forum. ikaw ang noob..bobo KA! !lang hiya!! your suggestion is so pointless...bobo ka ba? ?haha..wala ka sguro alam mag dota nu!! !haha..first,you will have the divine rapier..para patay agad!!! bobo ka lang!!! walang alam to!!tsk3!! haha..weak ka pala eh!!DOTA?? ?bobo ka!! Tangina Bobo Nung Guide . Mas Maayos Pa Yung Experiment Build Ko Eh . 32 0 12 Sa RGC . Puta . madali lng ba mag aral ng dota ..
pki sabi nman po mga gamit ni barathrum at kng panu to gamitin..! !